From now on, May will be Canadian Jewish Heritage Month across the country. The bill proclaiming the annual event passed third and final reading in the House of Commons on March 28. The vote was unanimous. The Canadian Jewish Heritage Month Act, known as Bill S-232, passed in the Senate before heading to the House. It’s expected to receive royal assent and become law in the coming weeks, meaning next month should be the inaugural Jewish Heritage Month. 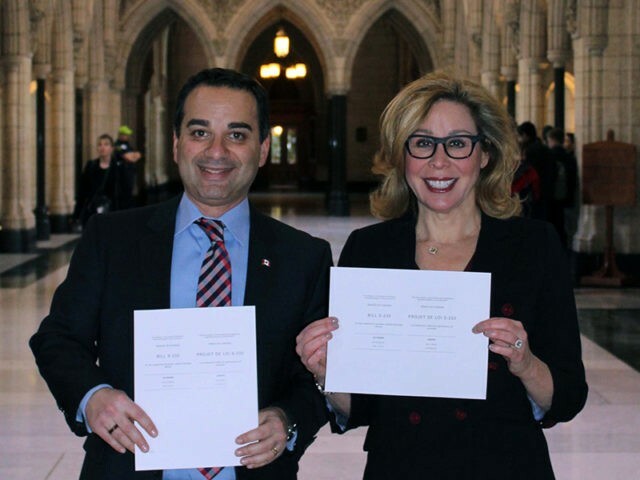 Sponsored by Conservative Sen. Linda Frum and Liberal MP Michael Levitt, the bill was introduced in December 2016, though the groundwork for it was laid in 2015, when former Mount Royal MP Irwin Cotler introduced the substance of the bill. Canadian Jewish Heritage Month “will provide an opportunity for all Canadians to reflect on and celebrate the incredible contributions that Jewish Canadians have made to our country, in communities across Canada,” said Levitt in a statement. The evening before the bill’s passage, several MPs spoke warmly of the Canadian Jewish community’s history and contributions to the country. She noted Toronto’s many Jewish cultural offerings, including the Ashkenaz Festival, the Toronto Jewish Film Festival and classes at the Miles Nadal Jewish Community Centre. Jewish Heritage Month “is going to be a chance to celebrate so much of what we have,” Dabrusin said. It was a “proud moment” in February 2016 when 229 MPs passed a motion condemning the global boycott, divestment and sanctions campaign against Israel, Albas stated. He made special mention of those running the Okanagan Jewish Community Centre in his riding. London NDP MP Irene Mathyssen mentioned Canada’s “none is too many” policy in regards to the admission of European Jews between 1933 and 1945, and of the ship SS St. Louis, which carried 907 German Jews and was refused entry to Canada in 1939, sending 254 passengers to their deaths in the Holocaust. In the years following the Second World War, nearly 100 Holocaust survivors found their way to London, Ont. Many “became active in the life of London as business leaders, doctors, academics, retailers, developers and political activists. They also developed religious organizations, corporations and charities,” Mathyssen said. She noted the launch in 2006 of the Shoah Project at London’s Jewish community centre to record survivors’ testimonies, and she quoted from them. Luc Berthold, a Quebec Conservative, noted that Canada is not the first country to create a Jewish heritage month. In 2006, former U.S. president George W. Bush signed a resolution proclaiming the month of May as the time to celebrate the contributions of the American Jewish community. Berthold praised Quebec’s Jewish community and listed many household names from the province: poet and singer Leonard Cohen; television host Sonia Benezra; Alan B. Gold, who, in 1970, became the first Jew appointed Chief Justice of the Provincial Court of Quebec (now the Court of Quebec), and then the Chief Justice of the Quebec Superior Court in 1983; Dr. Victor Goldbloom, the first Jew appointed to a provincial cabinet; Maurice Pollack of Quebec City department store fame; real estate tycoon Marcel Adams; grocery magnate Sam Steinberg; and the Reitman family, owners of the women’s clothing chain. To mark passage of the bill, Friends of Simon Wiesenthal Center has released a 72-page resource guidebook, available to community groups and school boards across the country, to enhance participation in Jewish Heritage Month. Ontario passed the Jewish Heritage Month Act in 2012. It, too, sets aside each May to mark various events on the Jewish calendar, including the UJA Walk for Israel, the Toronto Jewish Film Festival, Jewish Music Week and Israel’s Independence Day.